There nothing quite as American as a road trip along our great highways and a little yard sale shopping. If you love the idea of getting up early searching for treasures then you'll want to plan a trip to the South. Along Central Kentucky's US 60 Yard Sale spans more than 100 miles from Winchester to Louisville. The event includes seven participating cities as well as lots of yard sales and antique tents in between. As you travel along the route make sure to keep your eyes peeled for the many smaller sales that happen along the way. Participating cities include Winchester, Lexington, Versailles, Frankfort, Shelbyville, Simpsonville, and Louisville. Smaller communities along the way may also host sales. In addition to lots of yard sales, watch for food vendors, arts and crafts booths, tent sales, and local businesses featuring special discounts during the event. Plan to stay in one of the larger cities or in one of the many quaint bed and breakfasts along the way. After the yard sale ends for the night be sure to check out some of Kentucky's famous Bluegrass music scene for even more local culture. Watch for yard sale signs marking off-highway sales in cities and in smaller communities in between. If you see a treasure you absolutely love that's priced a little outside of your budget don't be afraid to haggle for it. Haggling is a tried and true part of every yard sale, just make sure you're willing to pay up if you talk a vendor down. The yard sale goes on rain or shine, so be ready to tackle any inclement weather. The US 60 Yard Sale doesn't officially start until Friday, but some sellers stay open on Sunday too. 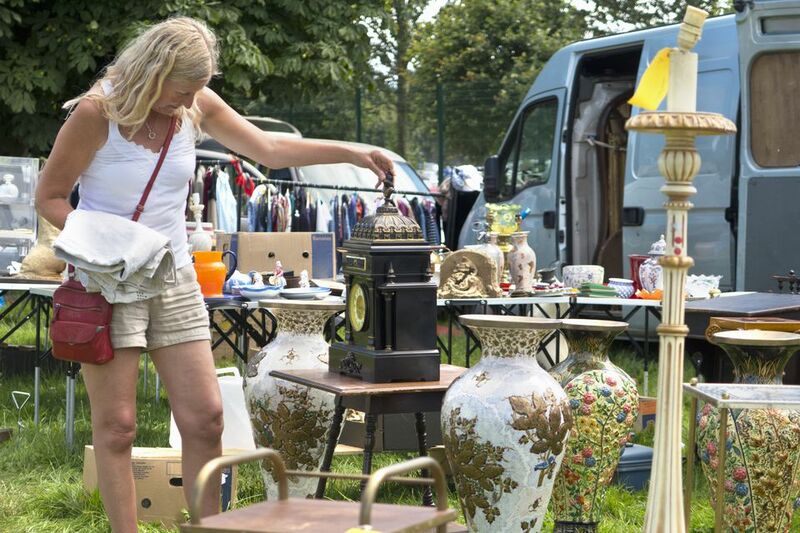 Brush up on the top 10 yard sale shopping tips before you go. Wear comfortable shoes and dress in light layers. Late summer in Kentucky is no joke, grab your sunscreen and be ready to face the heat. Stay hydrated! Drinking water will help keep you deal hunting throughout the day. Start early and plan to eat your lunch between 11 am and 2 pm, when the sun is at its hottest. Be careful about leaving old records in your car, if it's too hot the records can warp. Take plenty of cash and your yard sale toolkit. The yard sale has become a true community event where lots of new friends can be made. Be sure to check out the Facebook community devoted to the US 60 Yard Sale in Central Kentucky. If you want to be one of the vendors selling their wares at this monster of a yard sale, it's polite to make sure you have the permission of the property owner before you set up shop.